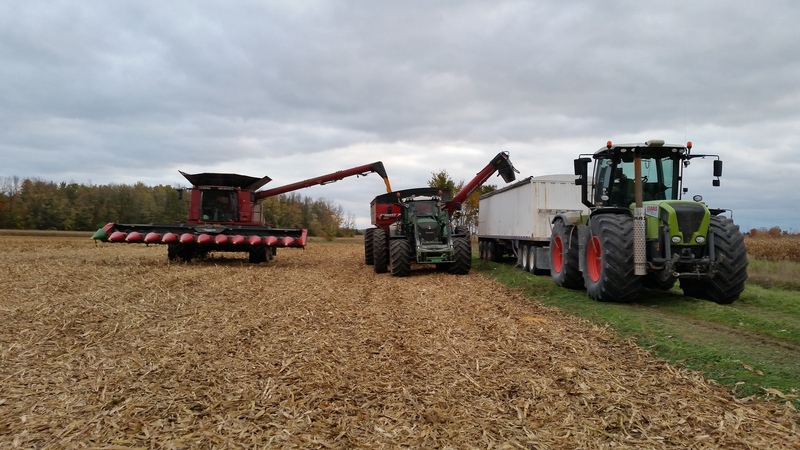 At Claussen Farms Custom Farming Inc. we offer a full line of farm services. Please scroll down or select one of the Services from the list below to learn more about the Services that interest you and how they can help ease your farming operation. Large grain tank - less unloading time! The combine is set up and equipped for gentle crop handling, precise and accurate residue handling because it is our belief that the success of the following crop starts with the combining job of the previous crop! Crop Input Purchasing: We offer the option to be part of the input pooling group for buying fertilizer and chemicals, generate volume discounts, work with reliable independent input suppliers. GPS & Precision Farming Services: GPS boundary mapping, GPS field entrance coordinates and topography mapping, autosteer, swath control, hand-held GreenSeeker NIR technology - used to assess health and vigor of the crop and calculates a fertilizer application. Aerial Imagery:We are equipped with a Phantom 2 Vision + UAV to take aerial images of your farm and crops. This has proved to be a valuable asset in making farming decisions. Mapping Services: GPS yield mapping of grain and forage crops, As-applied mapping for fertilizer and chemicals, including map layering. Soil Sampling Services: Grid or random sampling with GPS coordinate, provide sampling map for customer, Sending samples for lab analysis and fertilizer recommendations. Tissue Sampling: Can mark with GPS coordinates, take sample and have them analyzed to detect nutrition problems, only done if necessary or as discussed with customer. Pre-Sidedress N Sampling: Take soil samples as discussed and deemed necessary to determine available Nitrogen from manure and other sources in early summer, samples are taken to a lab for analysis and fertilizer recommendations. Field Scouting: Walking fields for regular scouting or problem solving, comes with a written report and recommendation. 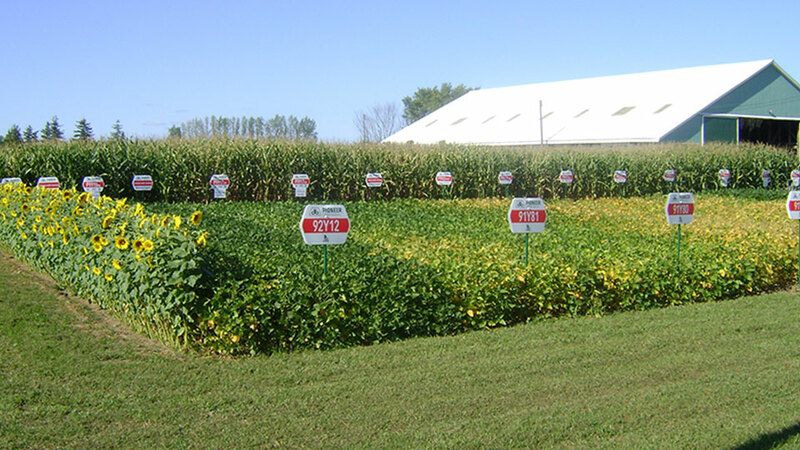 Cropping Plans: Setting up and developing a cropping plan for the up coming season, outlining seed, fertilizer, chemical and tillage requirements and get it printed on a single work document, comes with no charge for spraying and planting customers. One-on-One: Discussion and exchange about cropping issues, can be on a regular basis or as necessary throughout the season. Meeting with the client to discuss general cropping intentions. Set up a cropping plan that outlines all necessary work steps and inputs like seed, chemicals and fertilizer/ manure required and the necessary equipment needed, all inputs and work steps are shown with their individual costs. GPS boundary mapping the field and recording the field entrance coordinates. Several field scouts during the growing season with printed reports provided. Do additional services as needed like Greenseeker N requirement measurement or Pre- sidedress- N sampling. Do all available mapping of application, boundary and yield maps. Meet with client in field during the cropping year. Create a Cropping History Report at the end of the year showing the entire annual field history with its costs, yields and assumed net return based on crop sales price. We do the entire Crop Monitoring as described above. We do all necessary field work to establish, produce and harvest the crop. We use newest technology including Precision Farming Technology. We work with the client to meet his cropping intentions and needs. You own your crop we get paid based on results and performance. Our objective is to maximize your net returns and being in compliance with agronomic and environmental sound farming practice. We are sure one of our Crop Management Services meets your needs and will work for you. Broadcasting 28% UAN solution with the sprayer using streamer nozzles either preplant, preemerge, or in crop to corn, canola, grains, or other growing crops. In tall corn we are using boom draghoses to apply the fertilizer between the corn rows. In crop foliar feeding nutrient solutions with the sprayer using different styles of flatfan nozzles. Broadcasting all types of dry fertilizer with our air boom spreader either preplant, preemerge, or in crop using tramline systems. 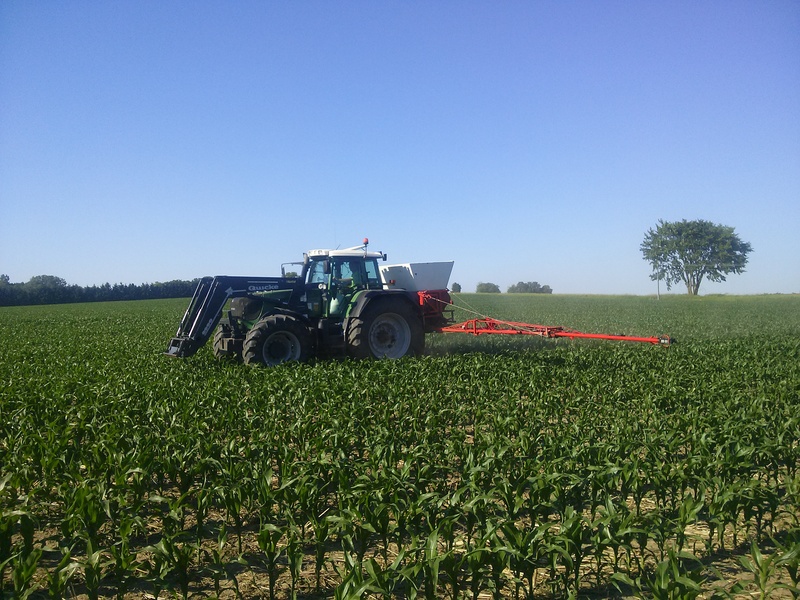 Sidedressing urea to 3 to 12 leaf corn using an aircart with a 16-row 30" coulter tool is the most effecient way to feed the corn crop. The applicators are equipped with auto rate control, autosteer, autoswath, and application mapping and we can supply the different fertilizer sources as well. We are currently running 2 Claas harvesters, a Jaguar 930 and a Jaguar 960. Both machines are running on high floatation tires with on board tire pressure regulation system. Besides that they are equipped with Pioneer inoculant applicators. High grade kernel processors, auto shear bar adjustment and auto knife sharpening are standard features on both machines. Auto Pilot, the Claas auto steer system, and Claas Auto Contour, and the automatic header height control system are other productivity and work quality enhancing features. The 40 km road speed and the 4 wd system are also helping in gaining productivity. Both harvesters are also mounted with Pioneer SLV units to apply inoculant to the feed. With a water resevoir on the harvester, mixing and changing inoculant is quick and easy. We are currently using 3,80 and 4,20 m wide pick up heads so that we can match all possible windrow configurations from direct cut wide spread windrows to narrow windrow merged together with our Kuhn Maxxmerge windrow merger. The Claas Auto Contour system avoids ground contact and controls the feed’s ash content by reducing dirt and soil intake. The Claas Orbis 750 10 row cornhead and a Claas RU 450 6 row cornhead are used for cornsilage in all row width because they both work row independent. Both headers are running on the Claas Contour system for close ground following and the 10 row header in addition is equipped with the Claas Auto Pilot steering system. Both options are dramatically improving header performance, reducing operator fatigue and that in return is improving capacity, productivity and overall performance. We can process high energy Corn Cob Meal using our Claas harvester with an 8 row JD grain corn head. 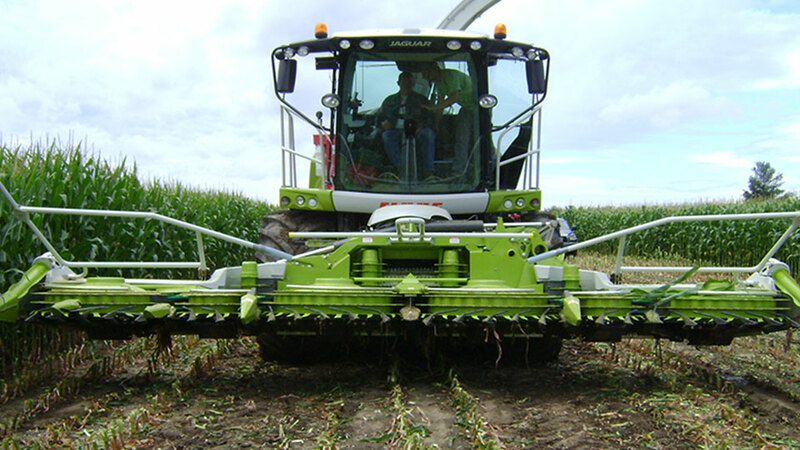 The Claas Auto Contour system as well as the Claas Autopilot system are used on both headers. The headers are equipped with special made very aggressive feedrolls that smash and size residue for easier residue break down and improved residue management for a following tillage pass. Silage hauling is done with tandem axle dumptrailers from 30 m3 to 40 m3 or from 15 mt to 25 mt payload. Additional options include 50 km/h road speed, hydraulic or air brakes, steering axles, and floatation tires. We also have 30 m3 silage dumptrailers for rent. Hauling grain is served with farm-style hopper wagons, silage dumptrailers, and truck style trains or bottom unloading trailers on dolly axles which are all equipped with air brakes. 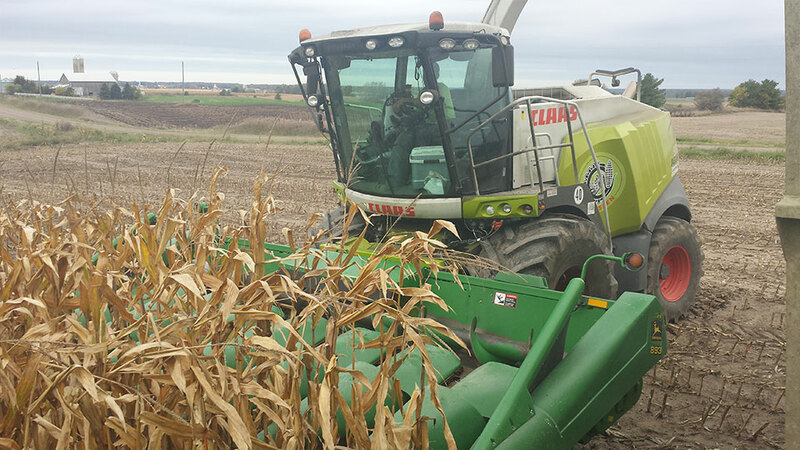 Our Claas forage harvesters are used as a stationary grinder in the field to grind High Moisture Corn. In that set up the harvester is basically used as a stationary feed mill. It is taking grain out of a grain hopper that functions as a temporary grain storage and is blowing the ground material on a dumptrailer sitting along the harvester. All corn grinding is done right in the field where it is combined so there is no dust and mess in the farm yard. The dumptrailers transport the ground material to the farm where it is packed into the bunk. This set up is the most efficient way you can find to produce high quality high moisture corn. In combination with the Case IH 8230 combine, this system ensures a high capacity of about 10 ac/h of corn combined, ground, and hauled into the bunker silo. We are offering this process as a complete service from field to bunk incl. packing. Do you need efficient equipment to produce high quality feed for your livestock? 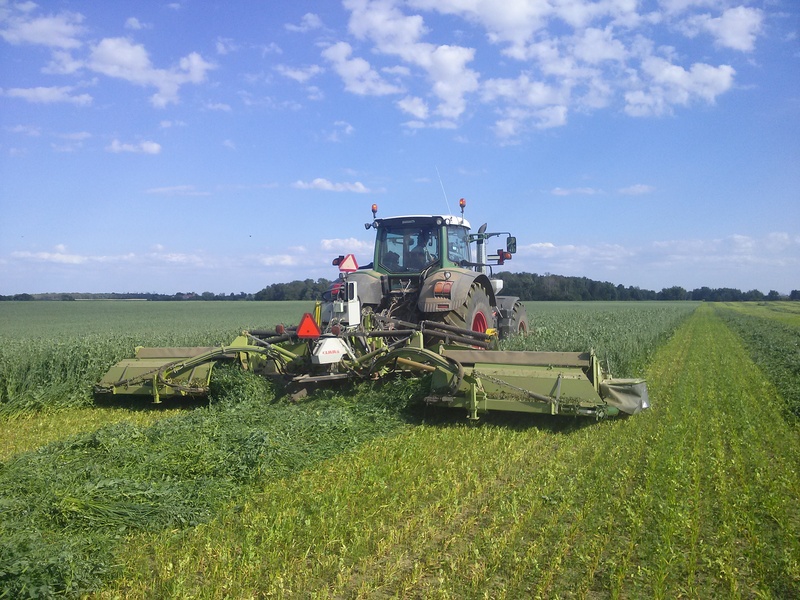 Our Taarup 4062C 20 ft pull-type mower and Claas 8550 28 ft butterfly unit will help you cut more acres in less time and get clean, high-quality silage and hay. Both machines are equipped with a tine conditioner, floatation tires, and merger belts. It is possible to have dual windrows every 20 ft, 30 ft, or 40 ft, or single windrows every 10 ft. As a result, no extra windrow merging is required. This saves time, reduces losses, and keeps silage clean and most importantly - the mower capacity matches the harvester capacity for the most consistent feed quality going into the bunker silo. The windrow width can be adjusted to match drying conditions and requirements. Packing the bunker silo is the most important and also the weakest link in the whole harvesting chain. We are using tractors with front-end loaders to achieve the required pushing capacity, maneuverability, operating weight and flexibility to match the different bunker silo sizes. We have been conducting bunker silo density testing for the last few years and we are using the test results to continually improve our packing technique and to train our operators and supply information to the farm operations to improve bunk management. We are currently using a JD 8320R, Xerion 3800, and a Fendt 828 with loaders and rear blades for packing. All tractors are equipped with duals, loader with a bucket, and a heavy 3pt bulldozer blade as a counter weight. The tractor operating weights are between 19 and 23 mt. A Fendt 820 with single tires, loader bucket and rear blade is used for packing smaller and high energy corn bunkers. Claussen Farms Custom Farming has been a Pioneer sales agent since 2006. We are selling, supplying and servicing all Pioneer brand products such as seed and silage inoculants. Besides these cropping products, Pioneer is also offering a variety of added value special services such as FIT GPS yield mapping, silage surface infrared photography and crop related information during the growing season. There is also a program available for children aged 15 to 18 called Corn Share. It is a great program for kids who are interested in farming and who would like to see the cropping side of things. Contact us for any questions or needs you have and we will try to serve you to our best ability with Pioneer brand products. The Vaderstad Rapid RDA 800C can plant in notill, mintill or conventional conditions with doing disc tillage or without. The 3 independent product compartments allow placing 3 different seeds or fertilizer at the same time. When doing that, row spacings can be selected as 5", 10", 15", 20", or fine seeds can be broadcasted. Fertilizer can be placed between the seed rows on all spacing configurations. The planting options and configurations are almost limitless. The Vaderstad drill performs best at speeds around 10 mph so that the 27 ft RDAC 800 is equal in capacity to a 40 ft airseeder. 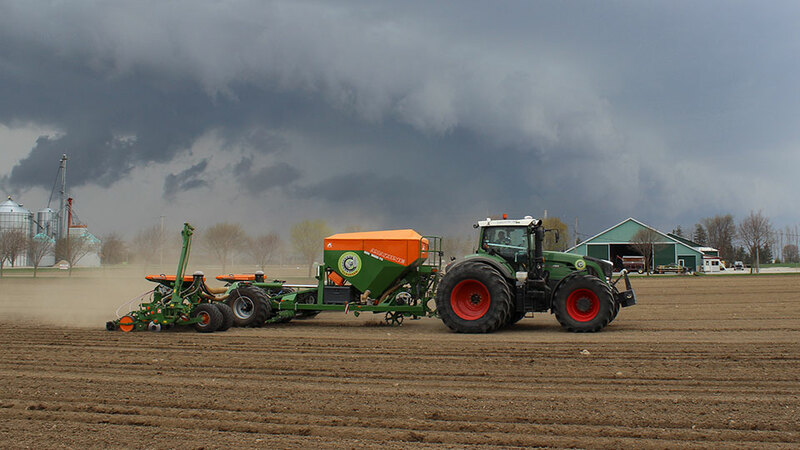 The Amazone EDX is a 12 row 30" corn planter with the capacity of a 16 or 18 row planter. This planter is run at speeds of 8.5 mph to 10 mph. It is a very compact unit with a dry fertilizer tank and two central seed tanks. The secret of this machine's precise seed placement lays in its unique row units with big gauge wheels and rubber block suspension on parallel arms. It is amazing to see the smooth bounce free run of the row units and precise seed placement that comes with it. Big fill ports, central seed and fertilizer tanks, and the high speed road undercarriage on the Amazone EDX allow for less set up time and more field productivity. The 16 row JD 1770NT planter runs with a FlexiCoil 2340 aircart for fertilizer delivery. It has a vacuum metering system and is running with a GreenStar variable rate system. The JD 1790 planter can plant on 15 or 30" rows and uses a liquid fertilizer system with a Central Commodity Seed system. A written planting report for each field is supplied. A well packed bunk is the key to providing high quality feed to your livestock. Since packing can be the weakest link in the hravesting chain, we strive to use the best possible machinery to achieve great quality feed. Silage density testing not only provides density numbers for the bunk, but also general bunk management and feed quality, and allows us to get feedback from our customers. A core sample is taken, weighed, and the dried down to get the dry matter. From there, a pH test is performed, as well as a temperature reading on the surface of the face at the back of the hole. This lets us know if the bunk is heating and if there is a problem that needs to be addressed. A written report is sent back to customers with actions and comments. Please contact us with further questions. This service is provided free of charge to our forage customers but is available to others at a charge. 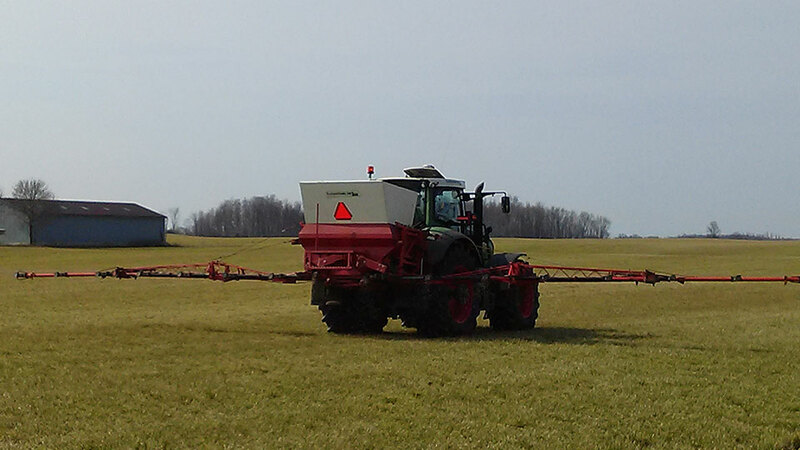 A John Deere 4930 self-propelled sprayer is being used for chemical application as well as for liquid fertilizer. The sprayer is transported on a truck based sprayer float that carries water and chemicals for an entire spraying day. A written spray report and "Applied As Maps" are supplied with all spray jobs. The GreenSeeker crop sensing system is a variable rate application and crop vigor mapping system that offers a more efficient and precise way to manage crop inputs such as nitrogen. The system verifies in real-time the amount of nitrogen the soil has made available using complex agronomic calculations called NDVI. The GreenSeeker system then determines a fertilizer prescription for instant application so that you are applying the right amount of nutrients needed by the plant. If the Greenseeker is not used for var. rate applications its sensors are still being used to measure the greenness via NIR and a vigor map is being created. This map is similar to the NIR images created by UAV’s and are an excellent scouting tool for detecting any plant stress situations the human eye will not catch. The sensors emit a burst of red and infrared light that is taken up by the plants. 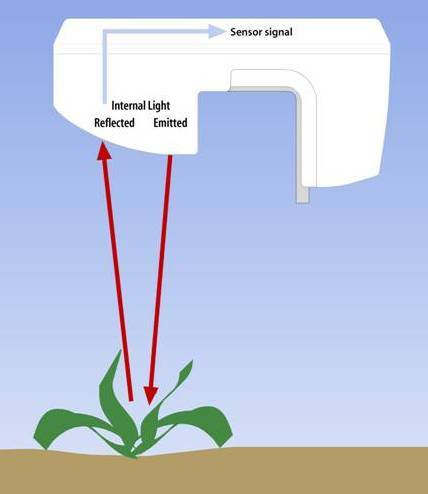 The sensors are then measuring the amount of light that is reflected back – basically measuring how green the plant is. Based on this light reflected back, the GreekSeeker will then calculate and adjust the rate for the amount of nitrogen needed in order to get the most yield out of those plants. In order to know how much nitrogen is needed, an N-rich calibration needs to bedone. The sprayer will drive over this N rich area, gets a reading of the highest rate of nitrogen that should be applied and compares this to a low spot of nitrogen in the field. This will then give a min. and a max. for variable rate application. This changes conventional farm practices because we are no longer applying one solid rate of fertilizer across the entire farm. In the past, we have use PS N samples in corn to determinedhow much additional N is needed, GreenSeeker gives us a real-time reading of nitrogen available the day of application. Many things can change in a field between soil sampling and fertilizer application, ex: temperature and moisture, which can affect the amount of nitrogen available to plants. We are applying the right product, in the right place, at the right time. The Greenseeker is currently adapted to read and apply N to corn, wheat and canola. Oher crops are under investigation are following soon. 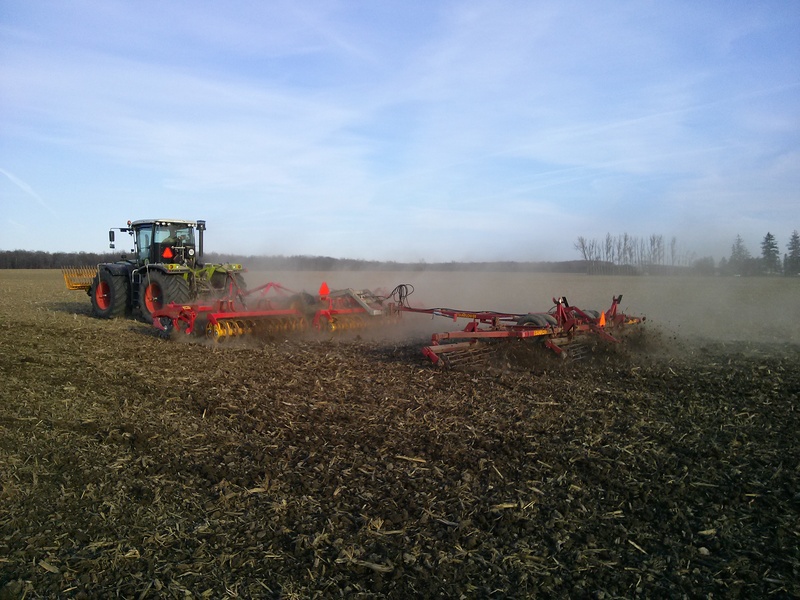 Bigger stones can be picked while doing the tillage pass using a stonefork mounted on the tractor's loader. The quadsaw is a four-bladed saw, mounted on a frontend loader, which is used to cut trees and branches up to 6" in diameter. It is used to clean up tree lines and fences to clear field boundaries. 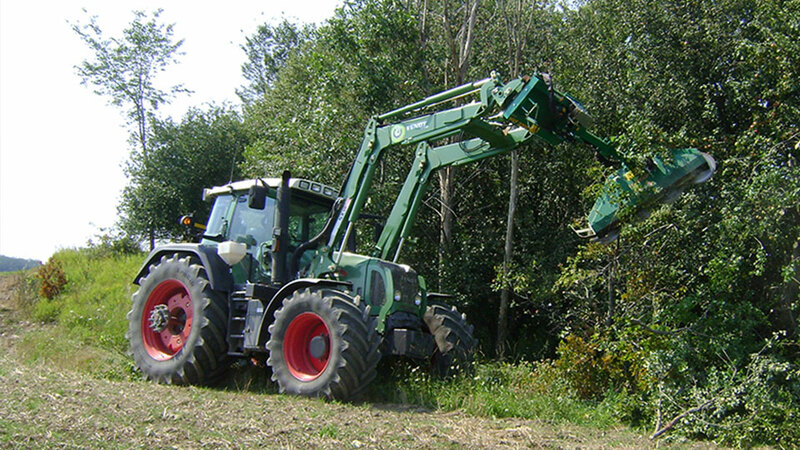 A following loader tractor, wheel loader or tractor with a grapple is used to clean up the cut off branches. This will increase field size, reduce tree shadows and avoid equipment damage from overhanging limbs. This can not only be used in fields, but also along snowmobile trails and other such trails. Copyright © 2019 Claussen Farms Custom Farming Inc. All Rights Reserved.